Admission is FREE to all these concerts! 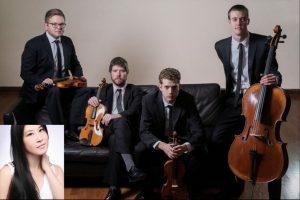 Sunday, April 14, 2 p.m.
Tuesday, April 16, 12-1 p.m.
Altius Quartet is an ensemble determined to further the art of chamber music through performance, education, and outreach. Deriving their name from the Olympic motto: Citius, Altius, Fortius (Latin for Faster, Higher, Stronger); Altius strives to communicate art to a more diverse audience through community engagement and innovative repertoire. The program includes movements from Brahms’ Piano Quintet, Mozart Concerto K.441-Quintet version by the composer, and Piazolla’s Libertango. Join us for this 1-hour lunchtime concert in the Canyon Theater. Admission is FREE to all these concerts–thanks to the generous support of the Boulder Library Foundation.